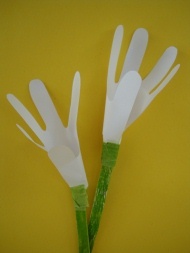 These Hand Print Lilies are a really easy flower craft for kids! Make your lilies white for Easter, or make them any color for a fun flower craft for Spring or Summer! 2. While the masking tape is still on the roll, color it green with a marker, 2" to 3" long. 3. Use the same marker to color you craft stick green (you could also paint these, but you'll have to wait for it to dry). 4. Wrap your hand print around the craft stick and secure it with the green masking tape. These are so easy, you could make a whole bouquet!